Taking liberties with a recipe is one thing, taking liberties with a recipe name is another. When Dorie Greenspan first published the recipe for Pierre Hermé’s famous double chocolate cookies, they were called “Korova Cookies” for the restaurant where they were served in Paris. Then, one day, Dorie’s neighbor told her that the cookies were good enough to bring about world peace, so she renamed them World Peace Cookies and that went a bit viral. For some strange reason, though, these cookies never made an appearance in my kitchen. Maybe it’s because, in my small-mindedness, I thought: “How good could chocolate chocolate cookies be?” Then, last week, I made them and they were so good, so instantly adored, I knew I had to give them an even more appropriate name; the kind of name that could make a viral cookie go even more viral. And so Shirtless Ryan Gosling Cookies were born. Worry not, though: you shape that into two logs, wrap with plastic wrap, and refrigerate for hours or days or even freeze for the months ahead. These cookies last a long time. They won’t look very done when they’re done, but just trust that after they sit on the cookie sheet for a little while after they come out of the oven, they’ll be perfectly set up. Like, I don’t know, the abs of a certain someone. And one bite of these and you won’t mind as each ab of yours morphs into flab. They’re really hard to describe: incredibly delicate, buttery, rich and oh so chocolatey. Eat one and you’ll already be eating another one before you can think about it. Whether you call them Korova Cookies, World Peace Cookies, or Shirtless Ryan Gosling Cookies, the point is you’ll be making them a lot. And with Dorie Greenspan’s new book “Baking Chez Moi” coming out this week, there’ll be plenty of more Shirtless Ryan Gosling delicacies coming your way soon. 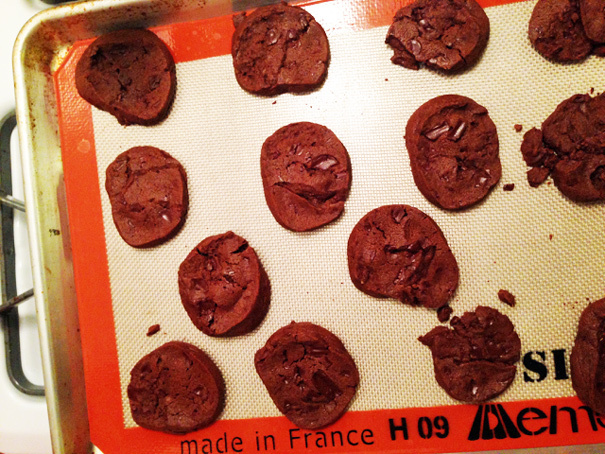 Summary: Based on Dorie Greenspan’s World Peace Cookies. Preheat oven to 325°F. Line 2 baking sheets with parchment paper. Using thin sharp knife, cut logs crosswise into 1/2-inch-thick rounds. 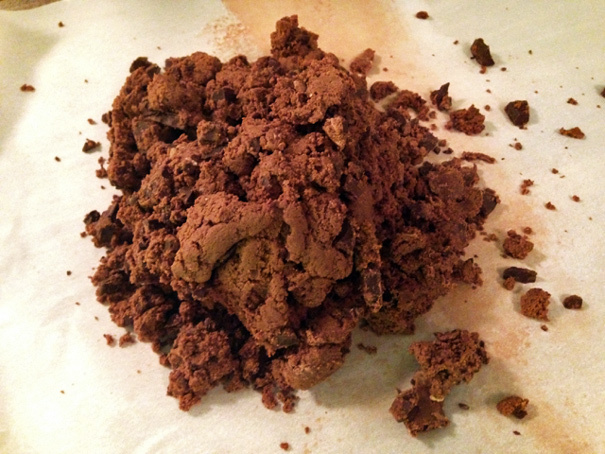 (If the cookies crumble here, just pack them back together on the sheet; they’ll re-fuse.) Space 1 inch apart on prepared sheets. 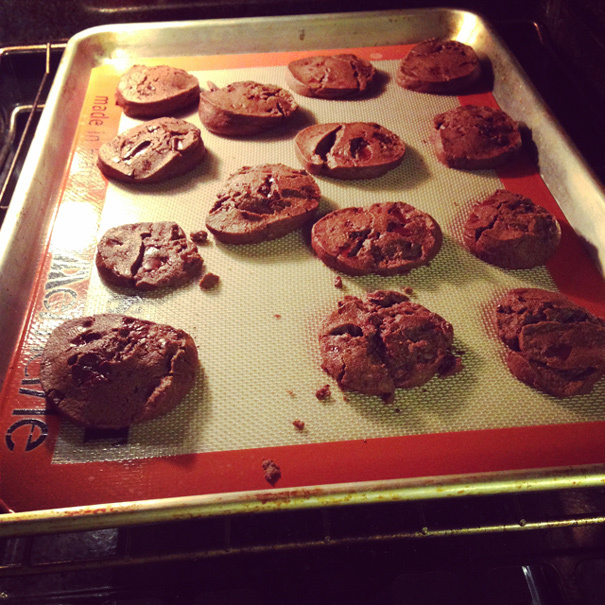 Bake 1 sheet at a time until cookies appear dry (cookies will not be firm or golden at edges), 11 to 12 minutes. Transfer to rack; cool.